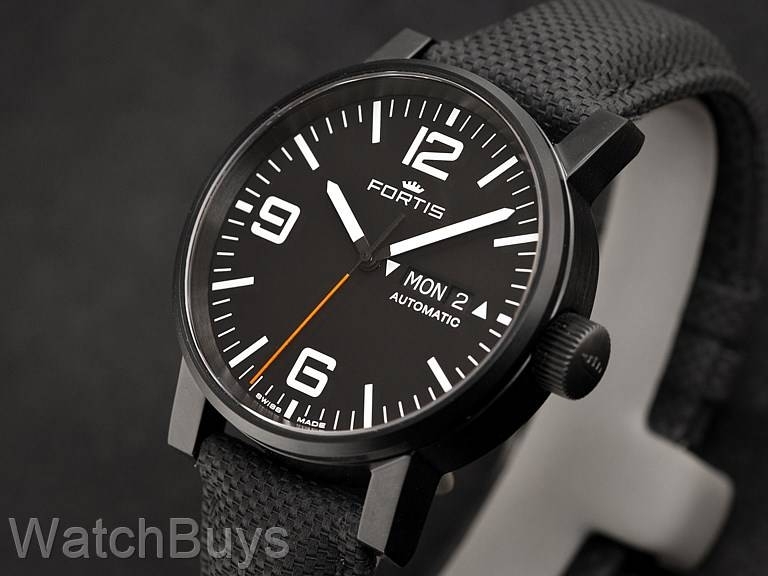 The Fortis Spacematic Stealth is housed in a matte black PVD 40 millimeter case, with white accents on the dial. Numerals can be found at 12, 6, and 9. White minute and hour hands are distinctly defined against the black dial. The hands (as well as numerals and indices) are all coated with SuperLuminova with a green night flow. Verified Owner Comments: Crisp ultra-legible dial, seamless day-date integration, perfect 40mm size, this is a pvd watch with style and class. The piece has a really nice heft to it and feels solid and robust. Mine is running about +2s per day out of the box. It is unique yet minimal, like a future 90s retro field watch. My only complaint is the strap is too long. My wrist is ~7 inches and I'm on the 2nd to last hole in the strap. If it were 6.5 I'd probably have to punch another hole to get it to fit. Overall very pleased. This one is a keeper. Verified Owner Comments: Easy to read, yet unique. After a few months has settled down to +5s/day. Could not use the strap, too long. Wears great on an MN Black Ops strap. Very happy with the watch & WatchBuys. "Great watch. Super legible. Included strap is awful." Verified Owner Comments: Watch arrived quickly and in perfect condition. Order process was smooth and staff were friendly. Watch is keeping very good time (gained 1 minute in about nine days). Had a person ask about the watch who turned out to be a watch collector, which has never happened before-even with my vintage Rolex! Great watch, easy to ready and keeps great time!